What is the largest drive these will recognize ? I need another one and will definitly get it here! Very pleased. It does its job reliably and without any fuss. If it reported the SMART status of the drives connected to it, it could be considered perfect. As it is, it is _almost_ perfect. PROS: Does what it's supposed to do, that is various RAID arrangements, very well. 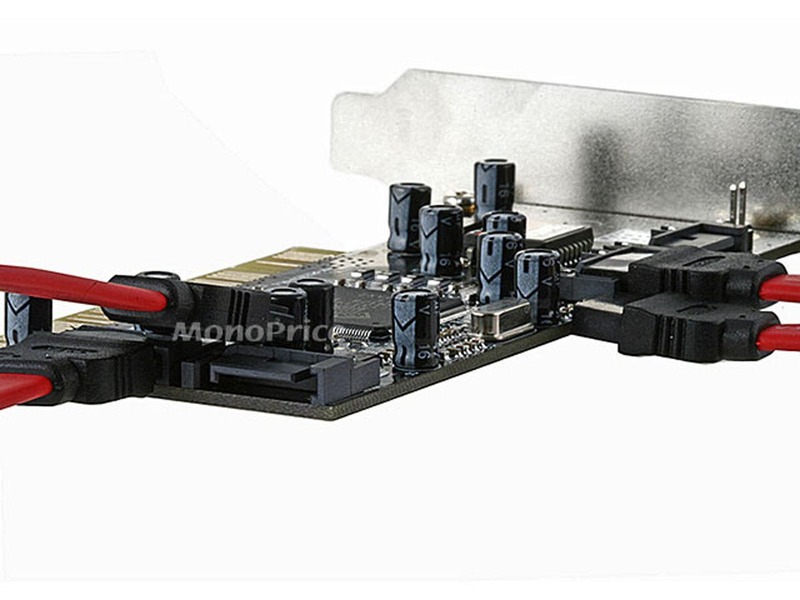 Quite inexpensive for a card that supports 4 hard drives in various configurations. CONS: Not really a con but a fact of life, the presence of this card, or any other RAID card, will increase boot time. This is simply the price to pay for having a RAID card installed regardless of brand. Fortunately, the "delay" is only a few seconds. A real con: it does NOT display the SMART status of the drives connected to it. This is an important omission. and the reason I rated it card 8/10. Had this feature not been missing it would have earned a 10/10. Exactly what I was looking for to complete my home made NAS. Works like a charm! I would recommend it to anyone looking to add multiple drives to their setup! This is a rebranded, reboxed Syba card which if needing correct drivers, sends you to a third different company to get correct software if you can decipher their product coding. This is not Monoprices fault. I installed the card, it installed as a Raid card. I wanted it to add only SATA ports, so had to reflash the bios of the card, easy enough, as was installing driver. Here is thw problem. This is on an older Dell machine. The adapter card is seen in the system bios, as well as Windows XP. Same with the two optical drives on the card. When you try and use either, you get a code 19 AND a code 28 error. These errors mean drivers are not installed on either the adapter or optical drives. 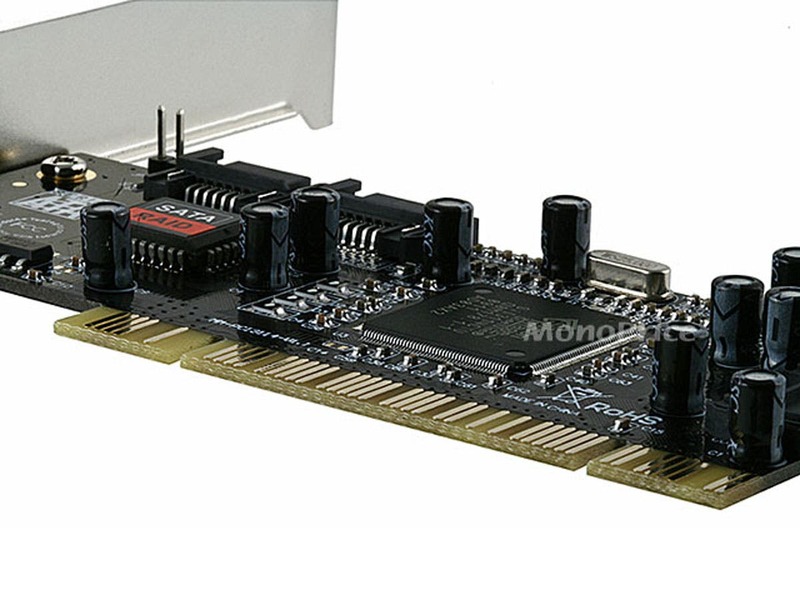 The drivers for the adapter card are installed because device manager sees them unless you try to use the card via the control card managent software. Neither drive came with driver software, nor is there any from the drive manufacture as they utilize the Windows system drivers. This leaves me with two unusable drives as well as an unusable adapter card. The same code problem shows up when trying to set card up as a Raid card as well. PROS: Decent price, ease of swapping bios between RAID and storage device. CONS: Difficulty of location of device drivers. Very poor instructions, no way to swap bios and drivers with software provided on driver disk. PROS: Works great! Tried several other brands and none worked well with optical drives. This card works great! Don't let the "RAID" word scare you off. I do not have RAID and installed this card in an old MSI K8 neo mobo with two 525 MBs SSD slipped in a 3.5 inch hotswap bay. I use as a "normal" PC on a LAN network. Worked from a cold boot with no OS. All I had to do is sit back and load the XP Pro OS. PC is powered up 24/7 since install on July 5th 2013 still working flawlessly. No meltdowns. Breathes new life into an old system. Much faster with the SSD's. Other people might think twice about tossing that old ATA drive computer gathering dust in the attic. With this little adapter, bring it into the 20th century for "brains" to run CAM mills, lathes. 3d printing. Headless LAN server, storage or a "smart" Linux based internet/LAN firewall etc. Or even building cheap systems others throw away for charity and make yourself the hero of the handicapped thereby adding to your self esteem and saving some landfill space ! PROS: Impressive. Works. Plug and play. I had high hopes for this card. Alas! doesnt work. figures. PROS: Cheap, lots of ports. CONS: Doesnt work. Driver CD contains every driver BUT the correct driver. The website is NOT user friendly. It also managed to corrupt on the the drives I had connected to it. So no thanks. Aside from the fact that there is zero Detection? CONS: Good luck getting this to work on Win 7. 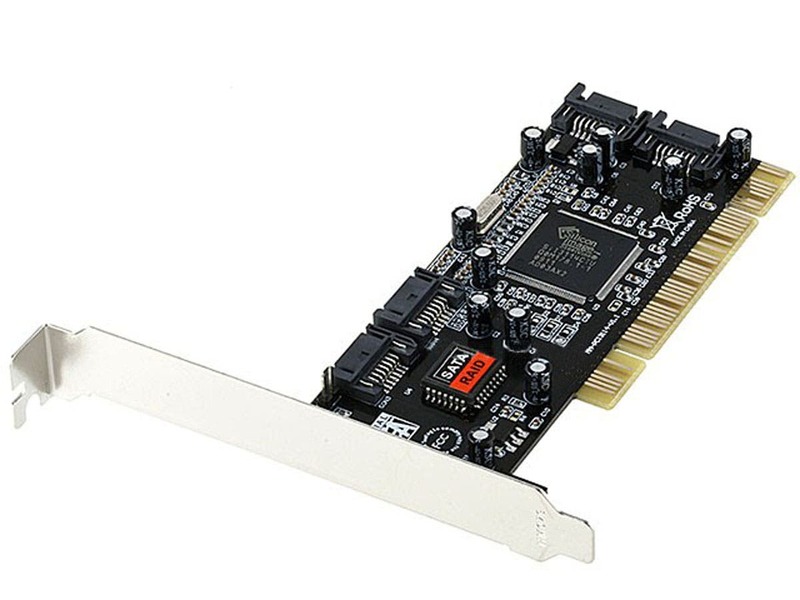 PROS: bought this card to use with unraid version 5b12 for 3TB WD drive, it just work, no driver required, don't expect it to run full speed as pci-x .